It is not every day that I have the privilege of viewing close to a thousand letters written by the Rebbe and by his predecessor, Rabbi Yosef Yitzchak, of righteous memories. I was recently in Montreal for the wedding of my brother-in-law, Yaakov Glassner. There, I met Rabbi Moshe Cohen, grandson of Rabbi Zeev Greenglass—may G‑d grant him a speedy and complete recovery. 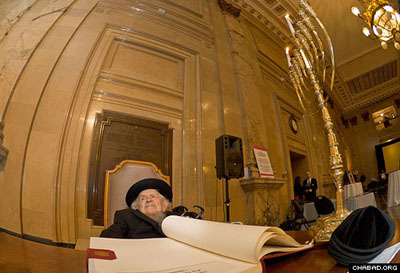 Rabbi Greenglass is a founding member of the Chabad-Lubavitch institutions in Montreal and had a special relationship with the Rebbe, of righteous memory, beginning yet in the 1940s. At that time, the Rebbe headed the education (Merkos L'Inyonei Chinuch), publishing (Kehot) and social (Machane Yisroel) arms of Chabad-Lubavitch. Rabbi Greenglass worked with the Rebbe, among other projects, on publishing books of Chabad philosophy, and he himself authored works on Lubavitch customs. I also knew that Rabbi Greenglass had been in touch with the Lavut family from Montreal with regards to obtaining permission to reprint the works of Rabbi Avraham Dovid Lavut, of righteous memory, the Rebbe's great-grandfather and a renowned authority on Jewish law. When I asked Moshe if he knew anything about this, he promised to look into the matter. I continued with my preparations for the wedding, and actually forgot about my request. Moshe, however, called me and said that the family would grant me permission to look through Rabbi Greenglass's archives. I arrived at the Cohen family's home and Rabbi Dovid Cohen, Moshe's father, brought out the letters... hundreds of them. 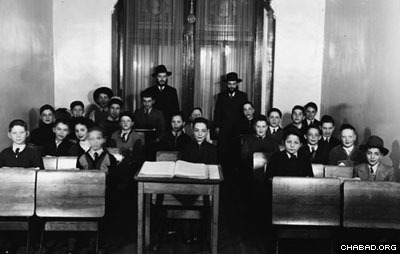 Close to a hundred of them were penned by the Rebbe before 1950, the year that the Previous Rebbe passed away, demonstrating the Rebbe's intimate involvement in Montreal's Jewish activities and programs even before he assumed the mantle of leadership. 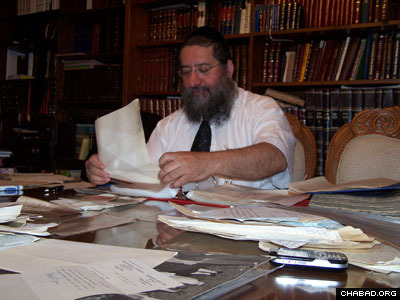 Rabbi Dovid Cohen with the letters his father-in-law, Rabbi Zeev Greenglass, received from the Rebbe. In the left corner is a letter from the Rebbe with blessings for a sweet new year. Many of these letters contained personal advice to Rabbi Greenglass, others pertained to his work with members of the Jewish community and as a mentor at the Lubavitch school. I was impressed by Rabbi Greenglass's sensitivity—he made sure to cross out the names of individuals about whom the Rebbe wrote personal information, so that if the letters were read by others – as I was doing – no personal information would be divulged. Here is a letter from the Rebbe, dated Elul 12 5709 (September 6, 1949), wherein he expounds upon the difference between the founder of the chassidic movement, Rabbi Israel Baal Shem Tov, and the founder of the Chabad stream of chassidism, Rabbi Schneur Zalman of Liadi. I am in receipt of your letter from Elul 6 [August 31]. I saw the manuscript of holy writings that you obtained from Rabbi Y. Horowitz, but not the manuscripts of Chassidic teachings that you mentioned. Once again, I urge you, as I did in the past, to put in writing everything you heard regarding the customs of the elder Lubavitch chassidim and ideas of chassidism, etc. – from Rabbi Schneur Zalman Schneersohn of Lodz [Poland], of blessed memory, and similar individuals. It seems that what the aforementioned Rabbi Y. told you is along these lines. It is a shame that you have not written in detail what you discussed. I also wish to remind you regarding the manuscripts of Chassidic teachings from Iaşi [Romania] that are in your city; they should be sent here—at very least on loan. I await your response regarding this. 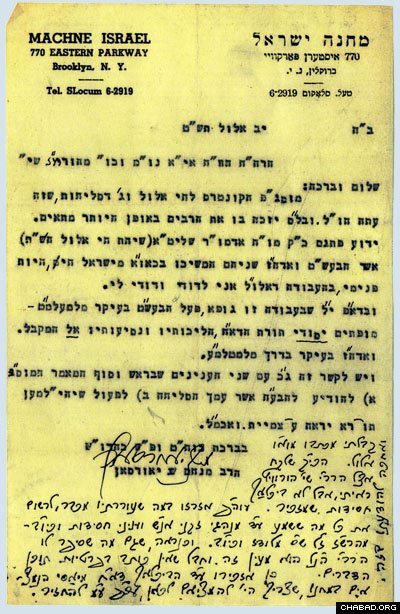 A copy of the letter from the Rebbe dated August 31, 1949.